However, the current VED rules changed on 1 April 2017, with a new tax system that will introduce a flat standard rate of £140 effectively for any car that’s not a pure-electric vehicle. You can read about the changes in more detail here. 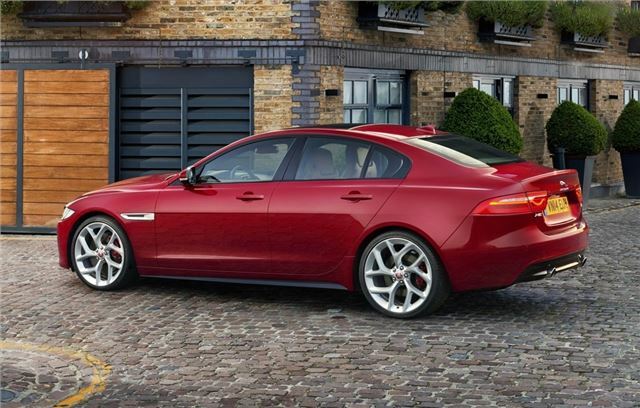 The XE has been one of the most talked about cars in recent years, and is the model tasked with taking on class leaders from the likes of BMW, Mercedes-Benz, and Audi. Fortunately, the basic recipe looks promising with an aluminium-intensive construction and a new range of four-cylinder ‘Ingenium’ engines that includes the one we’re interested in here, a 2.0-litre diesel boasting 163PS and a stout 380Nm of torque. I've been looking at the list of top 50 A band road tax vehicles. Most unfortunately are Diesels which should come with a severe Health Warning . Motoring experts should be in motion to remove Diesel Cars from Car Manufacturer's price lists. When are you going to start , this killing must Stop .SH Oxford. So when the mothers who drag their spoilt brats to school in a V8 petrol 4x4 they are saving the planet are they? This diesel v petrol argumant is now silly. The latest diesels are vastly cleaner than the old ones, and have less of an effect overall on climate change than equivalent petrol engines. Both are inferior to electric vehicles, and really the spoilt brats should be walking to school, and so should the mothers. Sadly, Mr / Mrs / Ms (??) Stanton, yopu are way off the mark and rather insulting to boot. A Euro 6 Diesel engine running correctly (Dieselgate will eventually sort this out fully) is as clean as the equivalent size petrol engine and substantially cleaner than the little turbo-powered 1 litre and below petrol engines that are being touted as the answer. I am referring to NOx output here, not to CO2 output. Once Diesels are removed from the market are you going to ban the suddenly noticed dirty petrol engines..?? Electric / hydrogen power is the future, and it should be the aim of every car owner to step up to the plate and change. YES, the electric ranges are silly at present, but that is a problem being overcome by battery research and the installation of more charging stations up and down the land. At present, only those who can afford the more expensive versions of the Tesla achieve near-hydrocarbon fuel range in their electric cars, so, we should be shouting at the manufacturers to get on with the job, while at the same time, producing better quality hybrids to cover the battery development delay. The argument that fossil fuel-powered power stations generate the emissions that the electric cars would have generated if they were petrol or diesel powered is false, except in those countries where the regulations are not being adhered to. It is very easy (but not cheap!!) to make a power station NOx emissions lie at or below the level deemed acceptable in the atmosphere because the space is available for the equipment required - basically the same setup as what is currently in Euro 6-powered diesels - and because the power generation equipment runs at near constant speed and load, the emission control available is so good that the system exhaust gases can be breathed safely. Your claim about particles emitted by Euro 6 diesels exhibits some ignorance of what Euro 6 engines do, which has nothing to do with particle size. This is taken care of by particle filtration which has very successfully been in use in all diesel engines since 2002. Euro 6 regulates the output of NOx gasses by injecting ADBLUE into the exhaust stream in finely controlled amounts determined by sensors upstream of the injection point to combine with the exhaust gas and neutralise the NOx content. A perfect engine running in Euro 6 configuration produces Nitrogen and water at the exhaust outlet. In reality there will always be a small amount of NOx due to inadequacies in the computer control of the injection system, and the rate of application of the accelerator foot by the driver (driving like a racer with rapid stop/go application of the accelerator pedal is extremely difficul for the onboard computer to keep pace with, Ablue-injection wise). If your worried about diesel pollution you should look out to sea.? our local ferry was replaced a few years ago..it burned 8500 gallons of fuel..to travel 80 miles..? it used waste called bunker fuel each trip to France.. 17.000 thousand gallons of this black sludge, mixed with lots of other waste a day..!!!! it ticked over in port leaving a cloud of the most revolting smoke I've ever smelled...i was a truck fitter for 10 years,im used to diesel fumes, they are not good for the planet or the body..Working with the local Council we managed to get it replaced, it was a 1970s ship..totally worn out..it was scrapped, the new one is less smoky but has I'm told a Cat...but we still see smoke and smell it most days..marine pollution is the biggest polluter in the world..but its all out to sea, where no one sees or hears it..its someone else's problem out there.. There are wide variations of solutions to our transportation problems but some will be very ineffective. Which then to choose? if we knew that we would have practical .realistic solutions and not theoretical Hog wash.may be we could help the planet more. Electric can be good but in order to allow the public see the picture clearly of how their choices effect us all proper figure for all emissions for transport should be compared like for like . including Tyre, Brake, suspension with electrical generation figure added to the total combined figures . The Massachusetts Institute of Technology (MIT? ) along with Various Universities in Scandinavia have done extensive work on this, so our Government should provide more accurate Data . Some smaller petrol engined cars are much lower in general Road emissions than the Tesla saloon car which they claim is emission free ..!!!!! Sorry that without provided detailed data as proof is blatantly a Lie . So don't you all rush out and buy one please . by all means small and less sophisticated high speed cars which won't make that much difference . This data is not secret so please check it out . electronically will take years to roll out across the Uk let alone across Europe generally . A denser populated country such as ours will require far more expenditure in Electronic senders . receivers and more gizmos than are properly available at present due to the use of scarce metals and elements . To make it safe we must do without any driven transport....... that will involve at least 20 years heavy expense and constant physical work for which we do not have the labour to do quickly .